5:40 AM Friday. Will do a major update at 9 AM. Currently, a weak band of snow is over NW Washington (light snow is reported at Orcas Is). 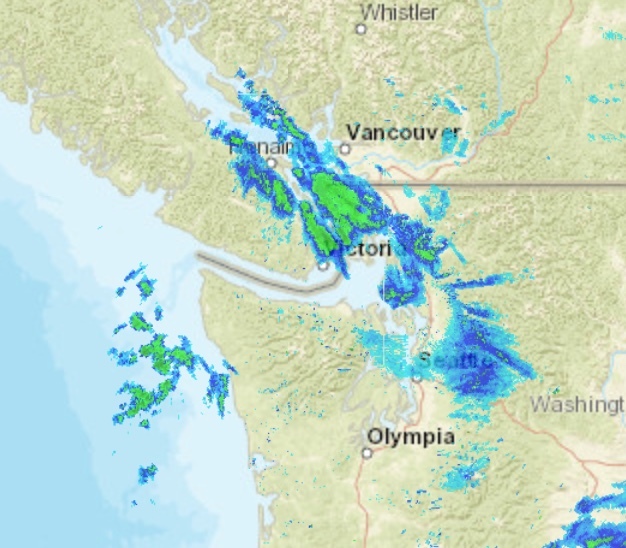 and a few snow showers approaching the coast..see radar below. The main show is not until this afternoon. The morning commute around Seattle will be fine. I am going to try NOWCASTING later today... frequent updates heavily using weather radar. We are now approximately a day out from the beginning of a significant snowstorm of the Northwest and the models are now converging inn their solutions. As a result, our confidence is now quite high that snow will begin falling earl tomorrow afternoon around Puget Sound, with an earlier initiation to the north, later to the south. The timing of the snow is critical, since the initiation of snow mid-day might leave folks stranded at work or lead to road grid-lock if everyone runs for home when the snowflakes begin to fly. The latest model runs suggest that the snow will reach the area by the early afternoon. 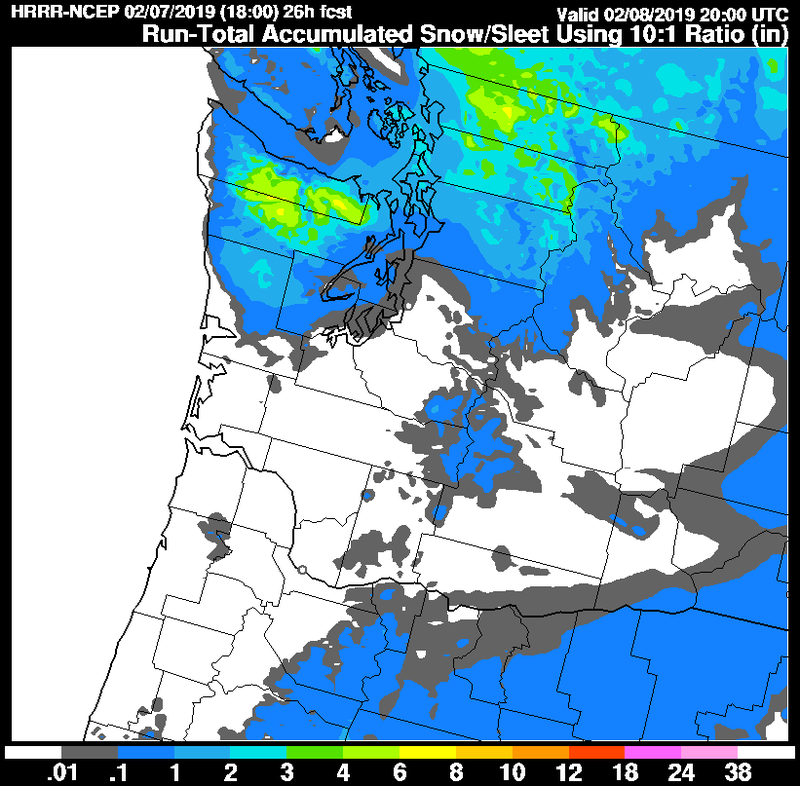 The UW WRF model shows the snow just reaching Seattle at 1 PM Friday (2100 UTC)--see below. With snow over the entire Puget Sound region by 4 PM (below) and will continue through much of the evening. The total snowfall through 4 AM is shown below: 4-5 inches around Puget Sound with more towards the Cascades and to the south. Weather.com combines many models and data sources using a sophisticated statistical engine; its forecast is consistent--starting the snow around noon. Why am I so confident going for this snow event? Because the models and virtually all the ensembles (running the models many times, each a bit different) are going for this snow event. 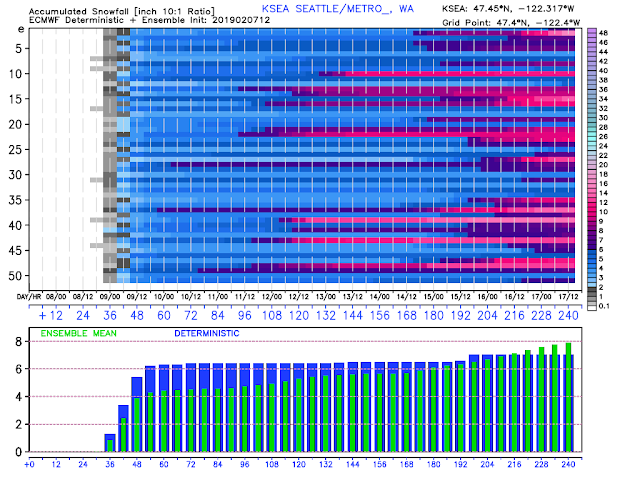 For example, here is the European Center ensemble of 51 members for accumulated snow at Seattle (top panel). Amazing--the prediction are almost all on the same page. Snow starts in the afternoon (09/00 is 4 PM Friday) and all get to the blue colors (2-8 inches). The bottom line is that the snow will move in during the early afternoon, and there will be some accumulation (at least an inch) by the drive-time home. By mid-day Saturday many folks will have 5-6 inches around Puget Sound. 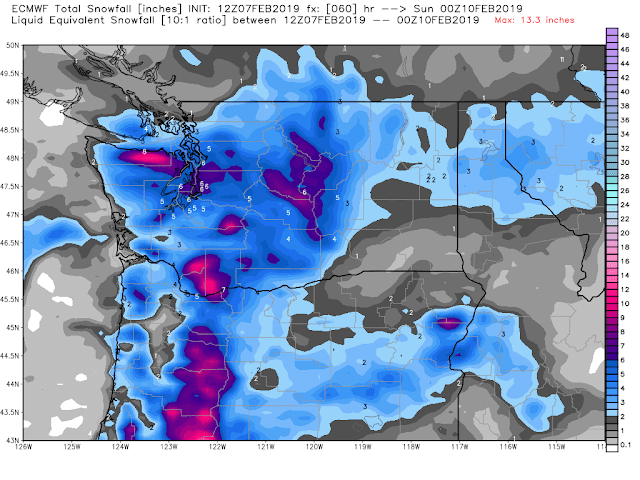 Similar amounts will fall over the eastern slopes of the Cascades, with more (like a foot) over the northern side of the Olympics and on the western slopes of the Oregon Cascades. Now the difficult part. Can we use this predictive information to avoid disaster tomorrow? Can we prevent widespread accidents and grid lock? I believe we can. If you can, work from home tomorrow. Use light rail if you are in Seattle. If you drive to work or school, head home early (before noon). And if you drive, park in a location that you will avoid hills. 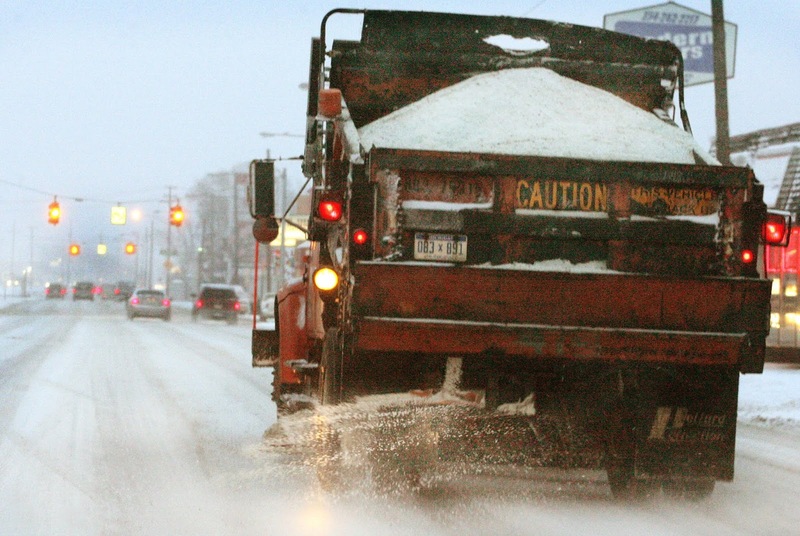 Local transportation agencies (SDOT, WSDOT) need to prepare the roads before the snow hits. That means using lots of salt and other pretreatments BEFORE the snow starts in order to prevent the snow from bonding to the road surface. And then aggressively plow the snow off, followed by more salt afterwards. How much later do you think it will take for this system to make it down to Portland, if at all? Thanks. One question on most minds is what about Monday and Tuesday? Is a third event looking less likely now? I found this comment funny, "And if you drive, park in a location that you will avoid hills." Now the conundrum, do I go into work tomorrow and leave early, allowing me to be more productive...or do I work from home and deal with the constant interruption from my young kids, being less productive? Thanks for the update Cliff. From your lips to my superintendent's ears, please. Hoping that my school district will do an early release so I don't find myself spinning out on I-90 or the WS Bridge as I head home. Disappointed with the latest models. I was hoping for more snow up in Bellingham. Oh well, maybe we’ll have better luck with the system coming early next week! Any weather forecast is hard to be accurate. No one model is always correct. I am more interested in the forecast about the second storm starting Sunday/Monday. That could be the really bad one if temperatures do not get above freezing. Disappointed with the latest models. I was hoping for more snow up in Bellingham. Oh well, maybe we’ll get lucky with next week’s system! Let's hope everyone stays safe. The detail you provided should be a great advantage to everyone. Cliff, I adore your blog! Any chance you have run the models for Portland? Should we expect similar snowfall? When looking at your graphics I am discerning somewhere between 3-6 inches for the Friday storm and 9-14inches for the early week storm in PDX? Your thoughts, or anyone elses? Many in the Portland Metro (including SW Washington) would love to know what you think will happen down here. Thanks! Is this looking to have a similar effect on Victoria from your perspective? Looks like snow for sure...but what in the system coming for what was coined as a “classic” major snow setup ( a day ago) is limiting the forecast to 4-6 inches everywhere? Right now, school districts are only releasing students at about 220. Do you think this is appropriate given the situation? Will this inevitably lead to chaos getting home as snow may begin falling as early as noon? Thanks so much for these posts. Moved my surgery up to today instead of Friday because of your forecast and arranged to do some follow up work at home on Monday (with some guidance from a great nurse). You are making a difference for a lot of people. And, I think your posts have helped the Weather service improve. I am still fascinated how the Euro model seems to nail these chaotic events earlier. Just finished reading Superstorm about Sandy and it's eerie how that played out the same way. Cliff! What do you have to say about the Olympic peninsula ? In your last post you mentioned high volume of snow on the northern side of the olympics? How is that looking as of now? Thanks! Are the models still consistent on the second round of snowfall starting Monday/Tuesday as you mentioned in yesterday's post? Well Cliff, your very reasonable warning sure has helped the grocery businesses get rid of bread, milk, and all the onions. Can anyone explain why all the onions are gone? It looks like the snow amounts for next week have moderated significantly, correct? I realize there's a lot of data to analyze and things change. Just to be clear, things have lightened up a bit from the original 12-20" predicted? I'm fairly certain we are going to get crushed up here in Ferndale (north Whatcom county). The nor'easters ripping down the Frasier Valley have set up a good dump scenario, no doubt. The Ferndale school district already called tomorrow a half-day based on what may happen. I truly feel for the people who have to make these decisions. They take it coming and going. Here's to a solid sledding snow day and people being smart, safe and warm. Thanks Cliff, as always, for the information. I think that total included Monday's possible storm. 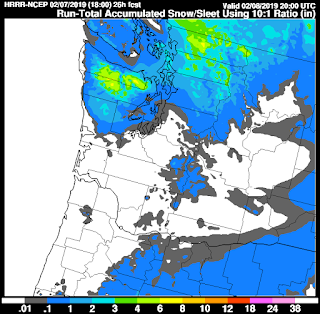 In regards to the Seatac locality, I doubt it will accumulate 1 inch of snow any sooner than late Fri night. That's because we haven't, to my knowledge, seen ~ 10-25 mph south winds today. If we get those winds tomorrow, at Seatac, then such snow is possible late Fri night and into Sat at Seatac - based on hisorical data. Maybe we'll get a ton of snow over the next 10 days, in Seattle, perhaps similar to Feb 1950. However, back then the temperatures were ~ 10-20 degrees F colder. I could easily be incorrect, but another possibility for Fri & Sat +, is cold rain for Seattle - as the eventual southern flow defeats the northern cold air. I took your weather class at UW. The lads and I really enjoyed it! Huh? Are you complaining none has been put out or you don't want any put down? So how much snow is granite falls predicted to get? I hear ya. 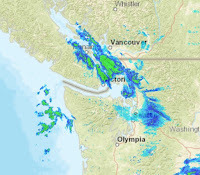 Im in Vancouver BC, looks like barely a flurry North of the border. The system early next week looks to dive even further to the south. Maybe Bellingham and the Lower Mainland have a better chance with another system later next week. That system, at this point, looks to hit further North. Still a long way out though and will it even still be cold enough? It's looking like it will. So no more apocalypse-level snow event come Monday-Wednesday? What caused the forecast to change so drastically? I knew it!!! I'll take 3 bowls please. Yes, what about next week's storm? The GFS is all over the map with what looks like some sort of stalled front come Tuesday and Wednesday...this looks like an absolute mess! The Monday system looks to go into Central Oregon. My gosh...this might be one to truly remember looking back. The system for tomorrow into Saturday and Sunday looks WAY stronger and colder. We are already at forecasted low temps in Oregon and SW Washington. What the heck is going on in an El Nino year...doesn't fit the normal pattern. This is pretty awesome! Looks to go on for another 14-22 days. @unknown...the system on Sunday night and Monday looks weaker than this weekend's and headed well south of Washington into Salem and Eugene. Another one comes in on Tuesday and Wednesday and more into the late week and weekend and looks to effect Oregon, the NW part, Central, and Southern Oregon area. I would say PDX gets 3-4" over the weekend (north of Wilsonville), and another 2-4" on Sunday and Monday. Depends how cold we stay and if this southern branch comes further north or stays south. The pineapple express to hit California looks extremely potent. This is a fascinating and unbelievable weather pattern. If the trend holds, Oregon might be the snow winner when this is all said and done. Thanks for all the hard work Cliff. 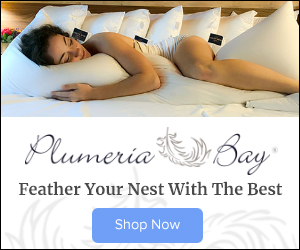 We love this blog! Z - It looks to me like Thursday's blog post only covers the Friday/Saturday event and doesn't talk at all about anything after. I've been seeing news sites in the area echoing the concern for the immediate event, including urging schools to close entirely rather than do an early-release, but I haven't seen anything suggesting that the longer-term forecast has changed dramatically. I'm going to wait and see what Cliff posts tomorrow and in upcoming days. On the one hand, I want it to be a light event so as to reduce the chance of injuries and power outages. But on the other hand, I kinda want it to be a huge event so we can all feel justified in stocking up and preparing so much. 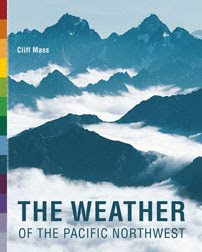 Morning Cliff - reading all available weather forecast info there seems to be substantial difference between the marine forecast winds, [admiralty inlet & Puget Sound] and everything else I am seeing. Typically the inland wind forecasts are less but not this much - Can you comment/explain why that's the case for this snow event wind forecast, and or share your inland wind forecast? Thanks in advance! I too am watching the radar, but I hit a snag: I wanted to compare against the ensemble members to see which was closest at 6am (02/08@00Z+15hr) and nothing really matches? Is it really the case that we collect no live observations that match our forecast model outputs? Are we stuck with bulk event daily/weekly observations for validation? The level of panic is truly laughable. We live in Sultan and woke up to a dusting of fresh snow. It's currently snowing lightly. Thanks for following this closely, Cliff. The fun has just begun this morning at 6:15 am in Glacier, and getting heavier as I write. I expected higher temperature(s) at the start (was 15.2 at this elevation); it's interesting to track that aspect (air temperature, density-SWE, shape of flakes, etc). Snow's become a hobby over the years - I've become a bona fide flake fancier. 8:00 AM in Fremont, Seattle. Snow flakes beginning to fall. Very light. Last night's 1.33km UW WRF 48 hour snowfall forecast is already a complete bust for the Spokane area.It was calling for maybe an inch or so of snow.Already 2" here,and still snowing,and the main event hasn't even begun yet.I don't think the model picked up on a warm frontal band that moved NE out of the low off of California.I'm curious to see what this morning's run predicts! Looks like everything regarding Mon/Tues was deleted? Snowing steadily for the past hour here in Port Angeles and sticking. 8" of snow from the last event at 800' elevation and not all melted off. Should be interesting come tomorrow morning. Hi Cliff - waiting on pins and needles for your major update at 9am! It seems to me that with more warning like this, and ever more sophisticated weather modeling tools as well as communication networks, the state should prohibit the use of studded tires. They tear up our concrete and asphalt. We pay for this damage by more frequent road re-building and repair, not to mention the delays caused by construction and the associated fatalities. We pay a tremendous amount for this use. I have a set of studded tires I put on my small truck only as needed...haven't used them for years. Port Angeles has been hit hard already. We have about 8" here of new snow this morning at 800' elevation. The forecast from WRF-GFS for 4pm today for Lummi Island was spot on. I agree with pre treatment and salt. Puget sound politicians spend our tax money on absurd programs and special benefits and ignore the average person trying to drive to work which is where they get the money from in the first place.